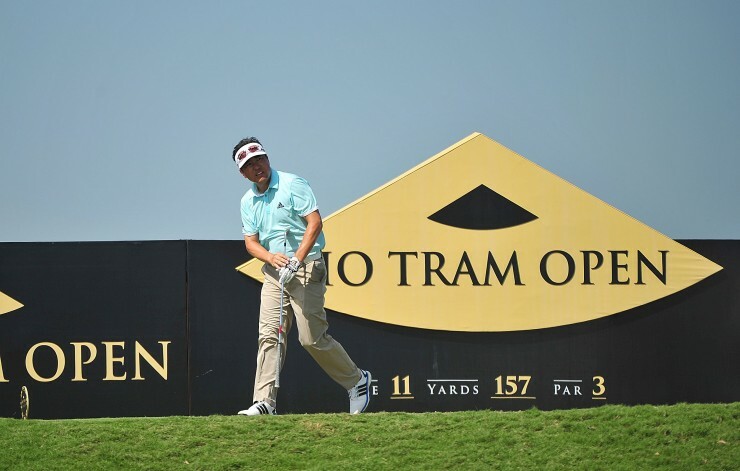 Korea’s Charlie Wi rolled back the years to establish a course record of nine-under-par 62 for a two-shot first round lead at the inaugural US$1.5 million Ho Tram Open on Thursday. The 43-year-old Wi produced a superb 10-birdie round, including five-on-the-trot, at The Bluffs Ho Tram Strip course to lead from Thai duo Danthai Boonma and 18-time Asian Tour champion Thaworn Wiratchant, both with 64s, in what is Vietnam’s richest sporting event. Malaysia’s Nicholas Fung, fighting to make Team Asia for the EurAsia Cup against Europe next month, posted a 65 which was matched by reigning Asian Tour Order of Merit champion David Lipsky of the United States and Chinese Taipei’s Lin Wen-tang, who was the best scorer in the tougher afternoon session with prevailing gusty winds. World number 12 Sergio Garcia of Spain and local hope Michael Tran were among those who carded a 66 to stay within striking reach at the Ho Tram Open, which is dubbed Asia’s Grandest Stage. The tenacious Wi, a seven-time winner in Asia and a regular on the PGA TOUR until recently, took full advantage of ideal conditions in the morning to give himself a chance of an eighth Asian Tour title, but the first since 2006. “When I showed up here on Tuesday and played the first few holes, I thought ‘Wow, this is a tough golf course.’ The good thing about this course is the wind is always constant so after playing a few rounds here, the players will get a feel of the course. The wind didn’t really pick up like how it can here (in the afternoon) so I took advantage of the situation,” said Wi. The straight-shooting Korean didn’t miss a single fairway and needed only 25 putts to give himself a chance of ending a lean spell in his career which has yielded only two top-10s over the past three seasons. “I didn’t know I had five birdies in a row. I usually mark my scorecard after nine holes or so. When I saw the birdies, I told myself I’m on a good run. I hit the ball really close. If you drive the ball on the fairway, you will have a lot of short irons into the green,” said Wi. Thai teenager Danthai, who broke through for his maiden Asian Tour title in Singapore last month, kept up his good form, finishing his morning round with five straight birdies from the fourth hole. “I hit it straight and putted very well, especially on the first nine. I bogeyed one but bounced back with five birdies. My putter was on fire. The course is a bit short but it is very windy,” said Danthai, a former amateur star. Decorated Thai star Thaworn, who turns 49 later this month, fired an eagle on five en route to his lowest round of the season and take a sniff at a potential 19th Tour victory. The double Asian Tour number one rolled in four other lengthy birdie putts. “Very happy. Everything worked. Putting was really good. I was making some long putts. Eagle on five, I hit driver and three wood to about eight yards and holed the putt. Condition was good for scoring,” said Thaworn. Swashbuckling Garcia was happy with his opening round which included six birdies against a lone bogey. “It was a little bit breezy but wasn’t too bad and a lot of the pins were down on some of the holes. The greens were perfect so you could make some putts. Overall it was quite solid,” said the Spaniard, who is seeking to end his year with a first win. Vietnam’s Tran outscored illustrious playing partners Darren Clarke (73) and Jeev Milkha Singh (70) with seven birdies against two bogeys. “I actually felt comfortable. My putting has always been off but if I can get my putter going then I feel I can play well every week,” said the 26-year-old Tran, who won on the secondary Asian Development Tour this season. Since opening in October 2014, the links-style layout located two hours southeast of Ho Chi Minh City has been hailed by many of the world’s leading authorities on golf. In January, GOLF Magazine named it one of the world’s best new courses. In July, the Australian Financial Review called it “as pretty a course as you’ll find on the entire Asian continent. Last month it was named the World’s Best New Course at the World Golf Awards ceremony in Portugal.